The city cited a homeowner for converting a residential property on Atlantic Street into a church and food pantry, according to municipal officials. Inspectors said the property’s owner, Jesus Sevilla, completed an allegedly illegal conversion of a garage at the property into a food pantry. He was also cited for not having a valid certificate of occupancy (CO), a government document that lists the usage of a specific building. Sevilla was expected to appear at the Paterson Municipal Court last week to answer for the citations. He said he has rescheduled the court hearing and is waiting for a new date. “I know I did it wrong. I admit it. I made a mistake,” said Sevilla, who has supported a number of successful city council candidates over the years, on Friday afternoon. He said there some people who are “mad” at him and are targeting him as a result. Sevilla would not provide any names. The Community Improvement division under David Gilmore has stepped up enforcement operations throughout the city. Earlier in the month, the division cited a mosque on Union Avenue for having a makeshift hovel at the back of the adjacent structure that was constructed without proper permits. The division also issued hundreds of summonses to the Art Factory owner and tenants for operating without COs.
Sevilla was cited in July. He said he has worked with an architect to correct the issue. He submitted a plan to the city two months ago, he said. 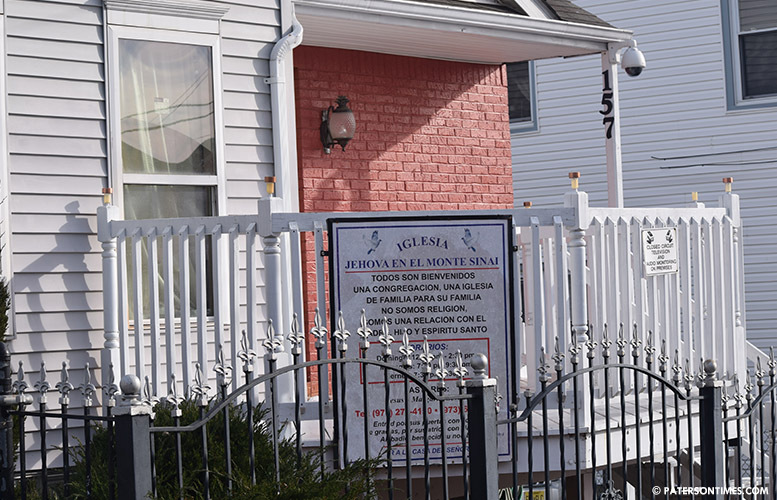 His church at 157 Atlantic Street has been in operation since 2009. “Nobody made a big deal of this before,” he said. At one point he said five people told him this would not be an issue. When asked if he was referring to council members, he would not say. He has supported council members Andre Sayegh, Maritza Davila, Luis Velez, Shahin Khalique, and Alex Mendez. Sayegh, who often invites Sevilla, a pastor, to conduct opening prayers at televised council meetings, praised the pastor’s work in the community. “I’m a supporter. At the Hispanic Heritage Month I hailed him as a community leader for the fact that he has a food pantry operating out of his church. We honored him,” said Sayegh. This food pantry provides for 300-400 people every month, said Sevilla. “I always help the community,” said Sevilla. He said his food pantry has been serving people of all races and classes. He also held a Christmas toy giveaway for 120 children this month. He was on his way to the market place on Friday afternoon to purchase more toys to distribute to local children prior to December 25th. Sevilla said his congregation at the church consists of approximately 70 people. He proudly points out his church is the only one in the Silk City to pay taxes. The church, Iglesia Jevoha En El Monte Sinai, is located in the 2nd Ward. He said the church has the support of the neighborhood — something he will need to secure a variance for the property. Khalique, who represents the 2nd Ward, did not respond to a call for comment. I am happy to see Brother Gilmore going after them illegal conversions. If you don't know, you can't just go about turning your residential homes into businesses, churches, and nightclubs. It takes away our property values and damages the integrity of a residential neighborhood. This man is doing good in the community but he need to be doing good by following the law. Good work, Mr. Gilmore. You doing what you promised us! Applaud Mayor Torres for making a good choice.